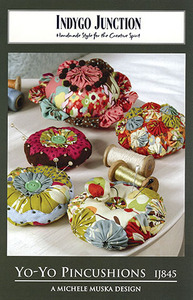 As contemporary as they are retro, these little gems are a charming addition to anyone's sewing room or studio! Use coordinating fat quarters or scraps from your fabric stash, then you can take the opportunity to get creative with great buttons, beads and threads! Sizes: range from 4" to 7" diameter.